You must be aware of the task switching utility available on Windows that can be accessed by the key combination Alt+Tab. Except the one on Vista- the Flip 3D, the task switching on Windows XP is so plain boring. So dump the inbuilt Windows tool and use any of the following alternatives to spice of the looks as well as improve it's functionality. 1. WinExposé: This program emulates a Macintosh Desktop by floating windows over each other like the Mac Exposé function. 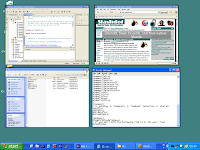 On pressing a keyboard shortcut or moving the mouse pointer to one of the corners of the screen, it immediately shows all opened windows on the desktop. 2. Task Switcher Power Toy: This PowerToy is released by Microsoft. In addition to displaying the icon of the application window you are switching to, it also displays a preview of the page. 3. TaskSwitchXP: TaskSwitchXP is similar to Task Switcher but looks better. It provides the same functionality as the existing application switching mechanism in Windows XP today. In addition to displaying an icon list, however, the application will also show a thumbnail preview of the window that will be switched to. TaskSwitchXP is open source. 4. Alt-Tab Thingy: Alt-Tab Thingy is an Alt+Tab replacement that adds brand new features to help you switch tasks faster and more efficiently than ever before. I like it's slightly oval look and rounded corners. 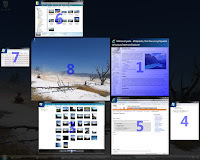 Apart from task switching, Alt-Tab Thingy provides a number of features like: drag and resize windows by clicking anywhere on the window; showing a preview of the open windows above the taskbar when you hover the mouse over a taskbar; minimizing of windows to the system tray and a few more. 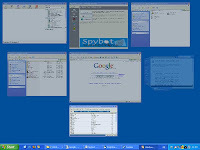 5. iEx: iEx is a utility for Windows XP that displays a grid of thumbnails, each representing an open window on your computer. When you click on a thumbnail it brings the corresponding window to the front, so it can be very useful for people who like to have a lot of windows open at once. 6. Switcher: Switcher enables you to switch between your open applications by showing you a thumbnail view of each one by tiling them across the screen. It's somewhat similar to Expose function of Mac. Switcher is only for Windows Vista. 7. TopDesk: TopDesk is the closest you can get to Expose. TopDesk has a number of different styles of displaying the open windows. You can show them in a 3D style like in Windows Vista; you can tile them on your screen; you can change the orientation so that they appear at various angles on the screen. TopDesk can be triggered by pressing a keyboard hotkey or a mouse button or moving the mouse to a corner of the screen. It's the best looking task switcher available. TopDesk costs $19.95. 8. Exposer: This is another task switching utility for Windows. Though not as cool as TopDesk, it still is a nice way to use alt+tab. Exposer supports keyboard hotkey as well hot corner where it's launched by moving the mouse into the hot zones on the screen. Price: $7. How could you forget WinFlip???!! Wow! WinFlip is cool. I never heard about it. Stupid me! Anyway, it's now added to the list. Thanks.